Everything comes from you, and we have given you only what comes from your hand." Donate online. Please check the notes below about online donation, then click the image on the right to proceed. You must use the Village Church Adventist Giving page for us to receive your donation. Make sure it says “Village Seventh-day Adventist Church” in the upper right hand corner (see image on the left). 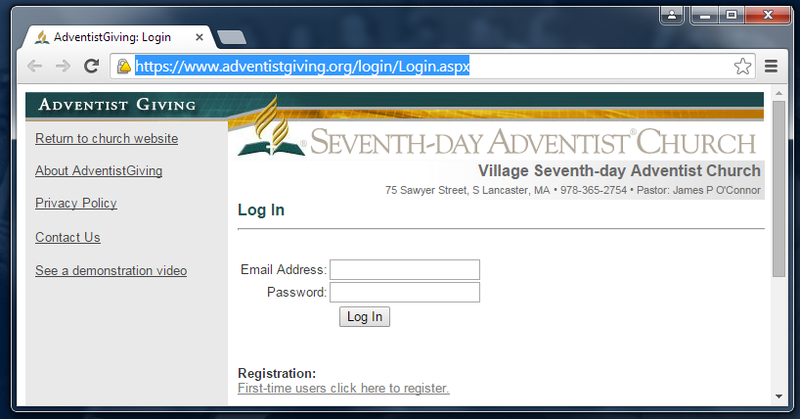 The first time you donate online, register with Adventist Giving. Just click their link "First time users click here to register." Don't worry, it's quick and painless. After that, just come here and click the image below. Choosing the electronic check payment option avoids card processing fees, making more of your donation usable. of your checks and deposit slips. Your bank can also provide them. Adventist Giving can save your RTN and account number, so you should only have to enter them once. in California on Dec. 31, you must enter your online donation by 9:00 p.m. California time. U.S. Mail: Letter must be postmarked by midnight Dec. 31 (check your post office for service hours) and received by Jan. 7. Mailing Address: PO Box 866, South Lancaster, MA 01561-0866. © 2018 South Lancaster Village Church of Seventh-day Adventists.